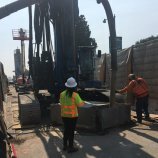 Amy Truong recently completed an internship with LA Metro through Lenax Construction Services, Inc. This three month internship gave Amy the opportunity to better understand construction management. “During my time there, I assisted with work for the Metro’s purple line extension. The highlights were definitely going out into the field and observing each part of the construction process at each station, following engineers as they performed quality control walks and geotechnical checks, attending meetings to see how everyone worked with each other, and being able to go underground to the station being constructed” said Amy. Catch a small glimpse of what Amy’s internship was like with her final presentation. LENAX is proud to play a part in growth of women in the AEC industry and wishes Amy the best of luck in her continued education.